Yoga is practiced, not mastered. There will always be room to grow. For some, this is their first class ever. For others, it’s their first group class away from the self-led home classes. And for others, it’s their millionth class and they swim through poses like a trout in a cold mountain stream. Wherever you find yourself, you’ll find us ready to help and encourage you in your yoga practice. 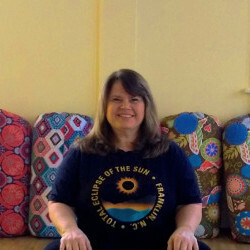 Studio Owner Jennifer McIntee took her first yoga class in 1998 while recovering from knee surgery. With a graduate degree teaching physical education, Jennifer transitioned from yoga practitioner to yoga teacher as she began to use yoga with her students in physical education classes. She continued her yoga journey beyond her school teaching career and now teaches yoga and leads the studio full time. Jennifer is trained through YogaFit Worldwide with her E-RYT 200 and RYT 500 including special training in Ayurveda and Restorative Yoga. Her passions are in therapeutic yoga and introducing students to the breadth of yoga practices. 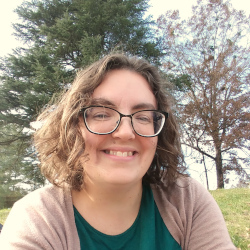 In addition to teaching weekly classes, Jennifer teaches numerous private sessions, yoga therapy sessions, hosts regular educational and outdoor opportunities for her teachers and students and holds regular yoga retreats in the mountains of Western North Carolina. Jennifer lives with her family in Franklin, NC. Homeschooling, homesteading, and homemaking are all a part of her life in addition to building yoga community through the studio. Jocelyn began practicing yoga consistently in 2015 and 2 years later was enrolled in teacher training through YogaFit. She loves teaching beginner yoga students particularly in Yoga 101 classes and helping others in their yoga path. When not practicing yoga, she is busy homeschooling her 4 children and caring for the many animals they seem to accumulate – all of which leads to the need for more meditation and yoga. Michaelle has been practicing yoga since 2010 and finds that it still inspires her to live each moment more mindfully, helps her to grow stronger, and encourages her to be more flexible. She has been trained through YogaFit and continues her training in order to help others thrive in their own yoga practice. Michaelle especially enjoys adding a bit of playfulness to her classes while still helping her students find their own strength, peace, and balance that continues even after stepping off the mat. Sarah started practicing yoga in 2015 initially in the comfort of her own home until she was comfortable enough to attend classes at a studio. After steady practice for over a year and still loving yoga to pieces, Sarah traveled to Bali, Indonesia for her 200 training through Frog Lotus Yoga International. She is also continuing her education as a student at Western Carolina University where she is majoring in art with a focus in abstract painting. 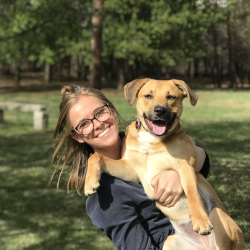 Sarah is a proud dog mom to an adorable puppy named Tucker, she secretly loves to bake sweet treats and to cozy up with a good book, and more than anything she hopes to continue learning and growing as a yoga teacher and student.